I have several email accounts I need to check regularly. The most important are a Gmail account, and a organizational account. For a long-time I have been using Thunderbird mapping both of theme via IMAP. This works alright. I thought I would switch to using the GMail webclient and adding external accounts. However, that does not support mapping IMAP, only POP3. I do not want to POP3, as that will break my ability to check the emails using my existing solutions. Nice to have a good search function. Though doing this without local copies is hard, searching local copies of just the headers (subject) is good. A suitable thunderbird plugin might do. If you have personal experience that it will not do things like delete my remote emails. Make a note of all of your settings and make sure that you know the password(s). 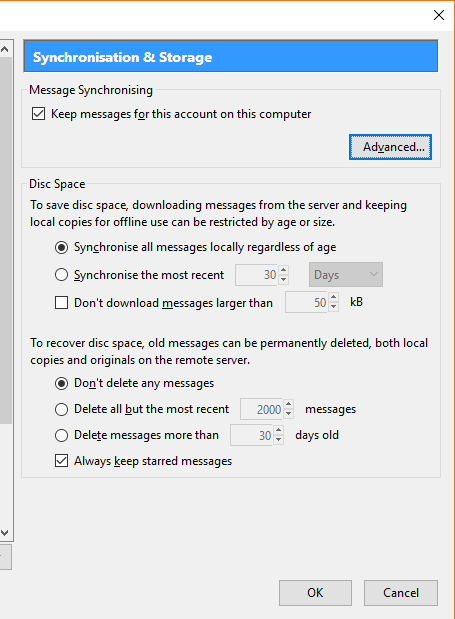 Set up your accounts making sure you set the synchronisation to not keep messages locally. Not the answer you're looking for? Browse other questions tagged windows web-apps email calendar email-client or ask your own question.